Posted July 10, 2018 by Seán Kinane & filed under News and Public Affairs, Sports. 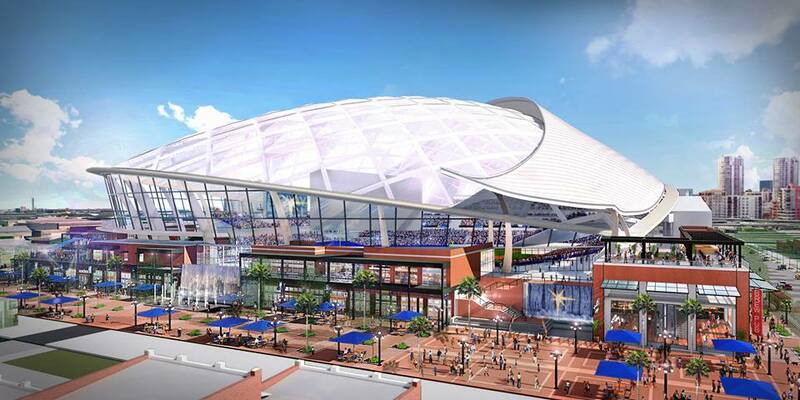 Proposed Rays stadium in Ybor City. From Tampa Bay Rays Facebook page. 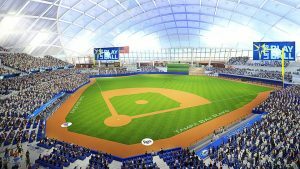 On Tuesday afternoon the Tampa Bay Rays unveiled their proposed Ybor City baseball park; according to the Rays, the project would cost $892 million, about a third of which would be the cost of the roof. The Rays expect taxpayers to fund most of the ballpark. The team hopes the stadium will have a translucent roof and about 28,000 seats. 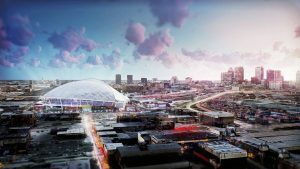 Team management says the ballpark’s futuristic design is meant to blend in with Ybor’s historic neighborhood and that it would be used year-round, not just during the summer. WTSP reporter Noah Pransky points out on twitter that there are other things Hillsborough County could spend the bed tax on that could have a better return on investment than helping an out-of-town owner build a new headquarters for his business. Pransky found nearly one million dollars in general revenue spending that could instead be covered by bed tax money.